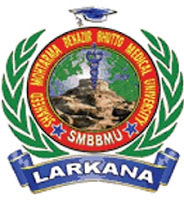 Shaheed Mohtarma Benazir Bhutto Medical University (abbreviated as SMBBMU), established in July 9, 2009, is a public university of medicine and medical scienceslocated in Larkana, Sindh, Pakistan. The university is named after the late Benazir Bhutto who was twice the Prime Minister of Pakistan and was assassinated in a political rally in December 2007. Professor Surgeon Dr. Sikandar Ali Sheikh became its first vice-chancellor.